3 Bedroom Log Home. 2.5 Baths. Accommodates 8 adult guests. On Cypress Creek! ABUNDANCE awaits you at Abundance Retreat's Sundance Lodge! Check out our wonderful videos on OUR website. 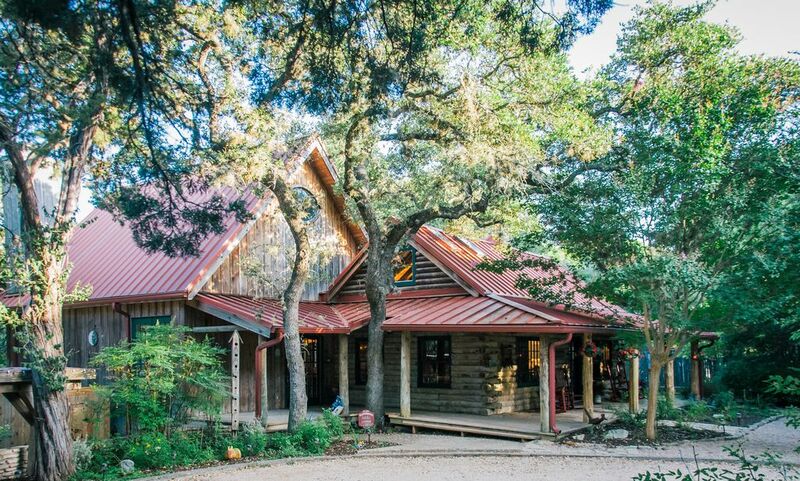 Simply search "Abundance Retreat Wimberley." Sundance Lodge is one of our two ADULTS ONLY - Pet Friendly lodgings at Abundance Retreat. Our guests -- people and their fur family - have come back again and again since we opened in 2004. They love the joy of being in nature in such a special place, and they tell us they truly love all of the special touches with which we welcome all guests. Located on sparkling Cypress Creek and just a 1/4 mile walk to historic Wimberley Square, Sundance Lodge, is named for it's bright and sunny interior. It is a luxurious, spacious 2800 sq. ft. log home with 3 bedrooms and 2.5 baths. The great room has a 28-foot high cathedral ceiling made of Norwegian pine, floor-to-ceiling windows and warm hardwood floors. This large living and dining area provides a perfect view of the grounds for you to enjoy, as you nest by the fireplace or watch the wildlife out the windows. The cozy den features pine log walls and a hand-crafted fireplace of Texas Hill Country stone. You and your guests can warm yourselves by the fire in inviting overstuffed leather chairs while playing games, telling tall tales or comparing your treasures from the day's antiquing adventure. Sundance Lodge has a fully-equipped charming country kitchen with a chef-quality stove, cookware and complete serving ware. It is great for preparing large meals, or whipping up some small snack plates, or dancing -- we think all kitchens should be enjoyed also for dancing. The Sunrise Suite is the master suite and is on the first floor. It has floor-to-ceiling doors and windows that open onto Live Oaks and sweeping vistas. Our Master Bath is of spa caliber -- shower in our Tree House Rain Shower which is complemented by petrified wood sinks and warm bathroom floors. With a king-size bed and a trundle bed, the Sunrise Suite can accommodate up to 4 guests and is spacious and comfortable. On the second floor, The Lily of the Valley Room has a queen-size bed and a cozy sitting area. High in the treetops and enveloped by fluffy bedding, you will feel like you are sleeping on a cloud. Featuring a Lily of the Valley motif, the room is appointed with classic greens and rich cream colors. Appointed with antique toys, vintage games and timeless books, Sundance's third bedroom, the Play Room, welcomes you back to your childhood. Twin beds, twin bear tables, and twin bunny lamps will bring out the kid in you. Let the fun begin! Outside, you will find the outdoor entertainment area with over 2,000 square feet of exterior patios and decking, an outdoor kitchen with a grill and smoker and a covered stone porch with rocking chairs. This expansive outdoor entertainment area creates a seamless connection of inside and outside, blending natural beauty with comfortable living. Connect with nature and soothe your soul on the peaceful and unspoiled grounds of Abundance. Towering Live Oaks, with outstretched branches, welcome you upon your arrival. Rays of sunlight gently filter through the leaves of Abundance's park-like setting. Deer, birds and butterflies will likely pay you a visit sometime during your stay. Spring-fed Cypress Creek winds it's way alongside your backyard, so clear that you can see the fish and turtles smile. Please note that there is a 2 night minimum stay. For Thanksgiving and Christmas, there is a 4 night minimum stay. For all other holidays, there is a 3 night minimum stay. Hello! Nice to meet you! That's me, Tina, on the right and my lovely wife of 29 years, Shellye, on the left. We're holding 2 of our 'boys' - - I'm holding Mahoney and Shellye's holding Elvis. Our other pups and kitties are not pictures. I'm originally from Escanaba, Michigan and Shellye is originally from Houston. We love to share Abundance with others that share a love for being surrounded by nature while sitting in the lap of LUXURY with your animal family members!!! Abundance Retreat is truly distinctive -- from its outstanding location to the quality and love we put into our home for you to how we care for you, our guests. See more on this in the "unique benefits" section below. After over 14 years of operating, we find that people come to Abundance to get away, have fun, or have a special gathering. They find so much more than that -- they find joy in the nature and beauty -- in the life -- that surrounds them. They find peace in connecting with the earth, with the sky, with the creek, with the deer, with each other and with themselves. They find creativity in our homes and property and also around Wimberley. And they find inspiration. These are the things we hear from guests. We encourage you to read our reviews. 1. LOCATION, LOCATION, LOCATION -- On sparkling Cypress Creek – it is in our back yard. Note, Cypress Creek is Wimberley’s finest creek – it is flowing and beautiful all year round - 1/4 mile downstream from the famous Blue Hole Park which features miles of hike and bike trails and the famous Blue Hole swimming hole – although most guests prefer to stay and swim on our property - Across the creek from a nature preserve – you are surrounded by wildlife and the bounty of nature and have the conveniences of being close to downtown, the grocery store, etc. - Proximity to the downtown square in Wimberley (super short walk to the Historic Wimberley Square) Wimberley – Wimberley is a sweet Texas Hill country town with historic roots and beautiful galleries, great stops, and top tier restaurants 2. QUALITY - We feature the work local artisans throughout both of our homes in the furniture and art selected for your enjoyment - We have used high quality construction products and materials also that reflect the local natural surroundings - Our construction materials and furnishings promote ecological sustainability where possible are non-allergenic and non -toxic - We created a Tree House Rain Shower for you! It is really cool! 3. CARE: We take care of our guests - Our homes are fully stocked with everything you will need and more and have labels guide you (note: you bring your food supplies) - Our guests often come to celebrate life’s important moments – and if not they find them there. We seek to provide you with a truly meaningful experience, not just a vacation -- they come back and back and back - please read our reviews - We help you have fun -- we provide you with lists of the “best of the best” of Wimberley and surrounding areas – things to do, restaurants and other - We welcome your furry family too! toilet, shower, We created a shower to look and feel like you are in a tree! We are 1/4 mile walk from the historic downtown Wimberley Square. The Square features galleries, restaurants, shops and bars with live music. Wimberley is a quaint Texas hill country town with great restaurants, galleries, shops and music. Sparkling Cypress Creek runs through the center of town and alongside our property, 1/4 mile away. Sparkling, spring-fed Cypress Creek runs through our backyard! We are actually "Creek Front" -- not lake front -- but VRBO doesn't have a filter for that. See below comments on "waterfront"
2 beautiful fireplaces downstairs to enjoy! Work on your laptop inside OR outside! The Great Room is truly a GREAT room! The cathedral ceilings are 28 feet high. The spaciousness is wonderful! Everything to have a small gathering of up to 12. Sundance has a GREAT kitchen! The Great Rooms Dining area includes a rectangle table that seats 8 and a round table that seats 4. We love games so there are TONS of them!!!! 3 kayaks and 1 canoe! The biggest 'amenity' of Abundance Retreat's Sundance Lodge is NATURE! You will be surrounded by wildlife - deer, squirrels, birds, creek creatures, and more. We love just sitting back and relaxing and enjoying the peace and quiet of our property. Sundance Lodge was truly a relaxing retreat for the Bear and his friends as they enjoyed being surrounded by the Texas Hill Country in a spacious, welcoming vacation home. While located a short walk away from the Wimberley town square, Sundance Lodge provided a private retreat during our stay. We enjoyed watching the multitude of birds, squirrels (including rock squirrels), and deer from the porch which overlooks Cypress Creek. The outdoor kitchen made for memorable meals with family, and the dogs were free to relax and enjoy their stay along with their owners (including a dip in the creek). Tina and Shellye were incredibly accommodating hosts, providing all the necessities for spending time at the Lodge as well as a wealth of information for venturing out in the nearby area for dining, outdoor activities, and shopping. The bear and his friends would highly recommend Sundance Lodge to visitors to Wimberley and the surrounding areas, and hope to return soon. We enjoyed a Wonderful Father’s Day Weekend at the Abundance retreat. Beautiful house, I couldn’t wait to wake up each morning and feed the deer, squirrels and birds and enjoy watching them from the patio. Great place to relax and play. Beautiful home with plenty of space for large family outing. You could relax on the deck and hammock or play a little on the water with the kayaks and floats provided. Abundant Relaxation on the river, walk into town! Our stay at Abundance was more than we could have ever hoped for. It turned out to be chilly that weekend, but it was so fun curling up by the fireplace and reading, playing cards and staying cozy. The house is beyond charming. The owners have done a beautiful job making sure you know where everything is -- we had everything we needed, plus some. The property was flawless and we simply can't wait to return. Thank you, Tina & Shellye, for sharing your beautiful home with us! -15 min walk from the house into town. Best location you could ask for. Our stay at Abundance was more than we could have ever hoped for. It turned out to be chilly that weekend, but it was so fun curling up by the fireplace and reading, playing cards and staying cozy. The house is beyond charming. The owners have done a beautiful job making sure you know where everything is -- we had everything we needed, plus some. The property was flawless and we simply can't wait to return. Thank you, Tina & Shellye, for sharing your beautiful home with us. Beautiful & relaxing getaway! Not to be missed! Our law firm held our management retreat at Abundance this past weekend. We had 4 adult couples & rented both the Moondance Cabin & the Sundance Lodge. Everyone had a wonderful time at Abundance! It was a perfect setting to get away, relax a little & get some intensive planning done for the firm. It was very apparent how meticulously everything was thought of and laid out for the comfort and convenience of the guests. I personally loved the fact that everything is labeled - from a drawer with spare iPhone chargers to the remote controls to the kitchen cabinets! It really made being in a new space so easy & you didn't have to hunt around for anything! Everyone loved the fact that deer food and bird seed were provided. We saw probably 6 or 7 deer & countless cardinals. We also got a chance to explore the creek behind the house a little bit with the provided kayaks & everyone loved that you could walk to town in under 10-15 minutes. The owners of Abundance also provided us with a document ahead of time that had all of their personal recommendations for dining, shopping, fun activities, etc. so I was able to coordinate everything ahead of time without losing any time by having to research it all myself. We will definitely be back for both firm events & probably personal plans as well! Wimberley is wonderful for relaxing, adventuring, shopping, antiquing, dining out, dining in, creek play and more!